The 50-plus audience is the largest demographic in our history, and one in three online seniors use social media. While the average age of social media users is fairly young, a large percentage of social media profiles belong to adults 55 and over. 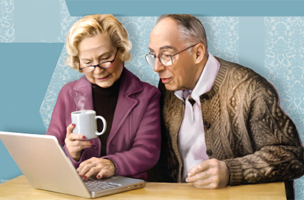 of Americans 65 and older who use the Internet, 77 percent of them are active on a typical day? What’s more, the older generation has the most spending power of any age group and accounts for 80 percent of all online luxury travel spending. Baby boomers also contribute 43 percent of America’s philanthropic activity. The infographic below by Accredited Online College debunks the stereotype that baby boomers are not-so-tech-savvy. Rather, this generation of power consumers is embracing digital media.